Many adult psychiatric illnesses originate in childhood or adolescence. Researchers have known about this for some time, and over the years they have conducted several regional, national, and cross-national surveys on youth mental health. Yet, it was only two years ago that data from a large-scale U.S. survey of adolescents—assessing a broad range of mental disorders with in-depth diagnostic interviews—became available. This 2010 data revealed that more than one in five U.S. youth aged 13 to 18 is likely to have experienced a mental disorder with severe impairment at some point. This year, two studies published in the Archives of General Psychiatry have expanded upon the analysis of that survey, known as the National Comorbidity Survey Replication Adolescent Supplement (NCS-A). A major finding, adding to the evidence that mental health problems often start in youth, was that within a 12-month time period, 8% of U.S. teens experienced serious emotional disturbances (SEDs), and just over 40% experienced some sort of mental disorder. Anxiety disorders were most common, followed by behavior, mood, and substance disorders. Mental disorders were defined as disorders appearing in the current Diagnostic and Statistical Manual of Mental Disorders (DSM-IV), developed by the American Psychiatric Association. SEDs were defined as mental disorders producing significant impairment in family, school, or community activities—as described by the federal government. Overall, the number of mental health diagnoses a teen had was more important than which diagnoses he or she had, in terms of risk of falling into the SED category. At a fundamental level, surveys like these help researchers determine how widespread a health problem is, and which populations are most susceptible. This, as well as other patterns in the data, may provide hints on causes or aggravating factors and suggest where, when, or how to intervene. Clinicians, public health officials, and policymakers are some of the major audiences for such research. “Policymakers need to know the number of people in the population suffering from specific mental disorders in order to plan treatment outreach programs,” Kessler explains. “There are many people with these disorders who do not seek treatment on their own, making outreach especially important for detecting mental disorders.” He emphasizes that this need for outreach is greater for mental disorders than for physical disorders, as the psychological barriers to seeking treatment are greater for mental disorders. Also, epidemiological data on mental health are important to policymakers making financial decisions. Correlations between mental illness and societal problems such as teen pregnancy, unemployment, domestic violence, or crime can reveal the long-term societal costs of failing to provide effective treatments. Indeed, the policy implications of certain disorder definitions or measures of prevalence may shape the design of epidemiological studies before they even begin. For instance, in the latest analyses of the NCS-A, SED prevalence was examined, because SED is a legally recognized term identifying mental disorders that the government is willing to treat in youth on Medicaid. Also, 12-month prevalence statistics were gathered in part because most health care policy planning is done on an annual basis, with insurance companies frequently imposing per-year limits on doctor’s visits or medication expenses. The distribution of U.S. teens aged 13 to 18 in the National Comorbidity Survey Replication Adolescent Supplement who had no mental disorders, one or more mild mental disorders (DSM-IV disorders not fulfilling criteria for serious emotional disturbance), or one or more serious mental disorders (DSM-IV disorders fulfilling criteria for serious emotional disturbance). Beyond revealing just how common mental illness is, the latest studies also provide hints on targeting interventions. 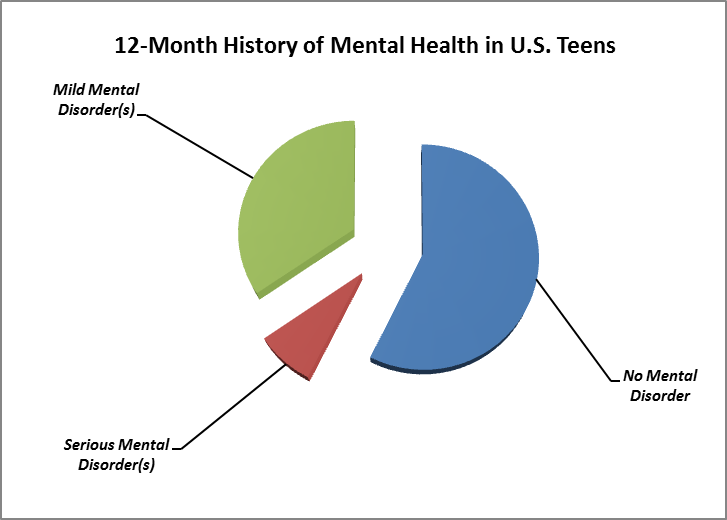 Kessler believes one of the most interesting findings is that the teens suffering most from mental illness—those in the SED category—tend to have multiple diagnoses (“high comorbidity”). Specifically, 63.5% of the teens with SEDs had 3 or more disorders. In other words, best practices for minimizing the impact of mental illness may be similar to those for fighting forest fires, lessening discord in workplaces, or dealing with international conflicts: Step in early and prevent escalation. Prevalence, persistence, and sociodemographic correlates of DSM-IV disorders in the National Comorbidity Survey Replication Adolescent Supplement. Kessler RC, et al. Arch Gen Psychiatry. 2012 Apr;69(4):372-80. Severity of 12-month DSM-IV disorders in the National Comorbidity Survey Replication Adolescent Supplement. Kessler RC, et al. Arch Gen Psychiatry. 2012 Apr;69(4):381-9. Do you wonder what it’s like to experience a “comorbid disorder cluster”? 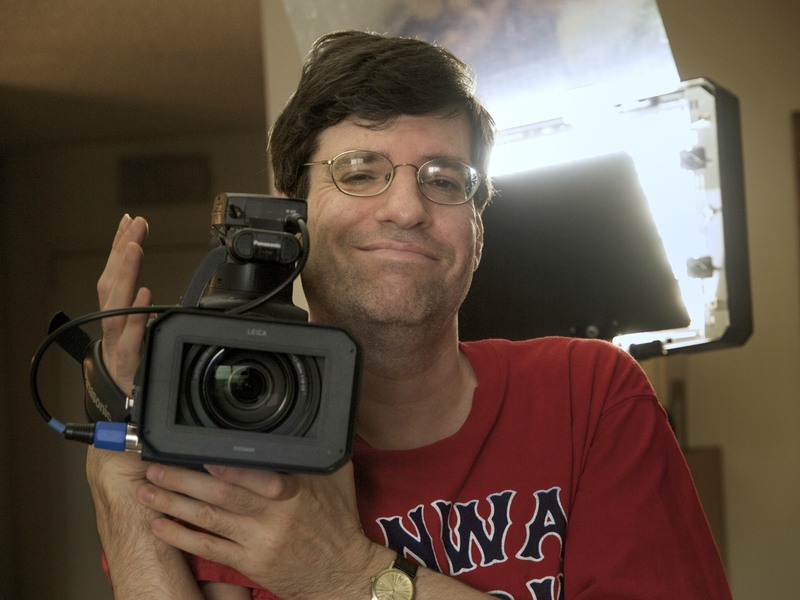 Recently in the press is the story of Bud Clayman, director, writer, and principal subject of the critically acclaimed documentary, OC87: The Obsessive Compulsive, Major Depression, Bipolar, Asperger’s Movie.